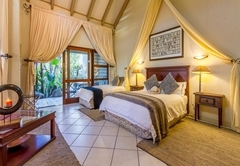 Jorn's Gastehaus is a highly recommended guest house with self catering option, providing accommodation in Nelspruit for tourists visiting the Lowveld Legogote region. 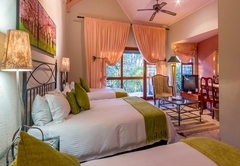 Located in Nelspruit and surrounded by a lush garden, Jörn's Gästehaus offers accommodation in well-appointed rooms. 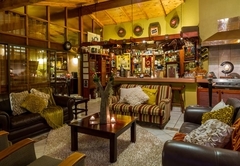 The guest house is 60 km from Kruger National Park, 150 km from Blyde River Canyon and 100 km from Pilgrims Rest. 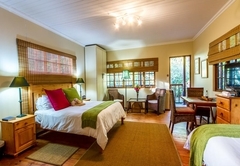 The Nelspruit Golf Club is a five minute walk away. A supermarket is located 3 km away. 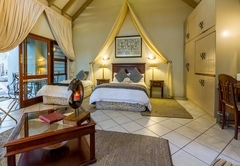 The units stand apart from the main house, each with its own private entrance, sitting room and en-suite bathroom and three rooms are semi-attached to the main building. 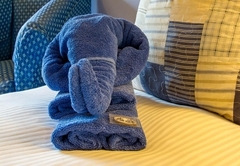 The keyword throughout is unparalleled luxury. 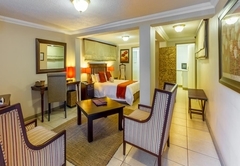 We have ample free on-site parking close to the rooms and facilities. 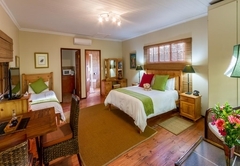 The different accommodation types range from Double Rooms to self catering apartments. 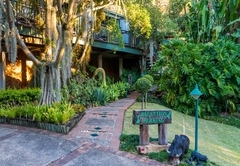 All are spacious and equipped with TV, air conditioning, a fully stocked mini bar and a patio or balcony. 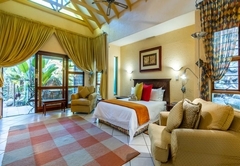 Views of the lush, tropical garden can be enjoyed from most rooms. 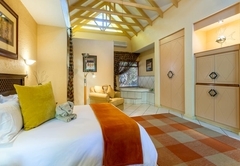 Featuring a shower and free toiletries, some of the rooms also have a bath. 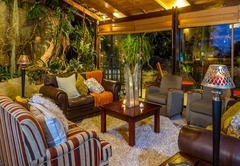 The main building offers a beautifully decorated lounge and fully stocked bar overlooking a sparkling swimming pool with some of the best views in the Lowveld. 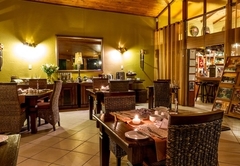 Enjoy a sundowner and watch the surroundings change into a magical twinkling night-scape. No two sunsets are the same! 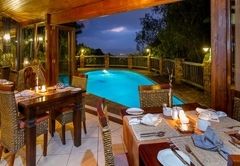 Situated next to the lounge is a superbly appointed dining area also looking over the pool and landscape, where breakfasts are served. Excellent attention to detail makes this a special place to start the day. Dinners can be arranged, however they must be booked in advance. Our conference room is ideal for small groups, typically management meetings, strategy or brain-storming sessions away from the office, ensuring privacy in pleasant surroundings. 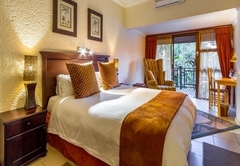 A walk around the subtropical garden or quietly lazing around the pool may take away those stresses from a hard day's work or allow you time to capture your day's events while on holiday in the Lowveld. Relax and unwind enjoying the sumptuousness of your surroundings. 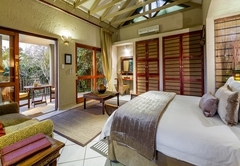 This room has two single beds, a lounge area and a bathroom with shower. 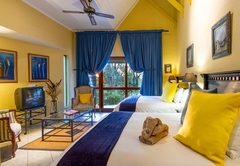 It is equipped with a desk, air-conditioning, minibar and features a furnished balcony. 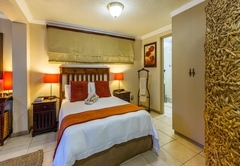 Located close to the main building and the swimming pool, this spacious and air-conditioned unit is furnished with a double bed and a sleeper couch. 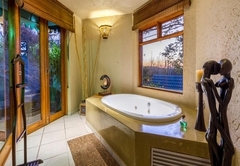 The large bathroom is fitted with double basins, a bath and a shower. Children over 6yo under 12yo only. 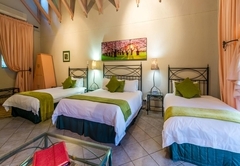 The air-conditioned one room apartment offers a double bed and a double sleeper couch for 2 children as well a patio and a kitchenette with microwave, fridge, minibar and tea and coffee making facilities. The bathroom is fitted with a shower. 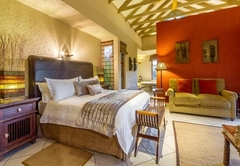 This family unit offers two Queen sized double beds. 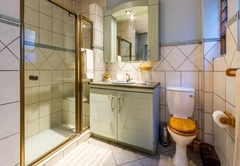 A doorway leads to a large bathroom with a spacious shower. 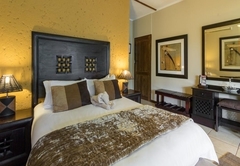 The room has a lounge and is equipped with a TV, mini bar, a fridge and tea and coffee making facilities. 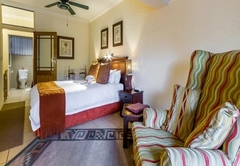 This air-conditioned room has a Double Bed and two three-quarter beds as well as a lounge area with TV. 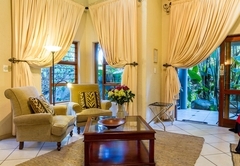 It offers a furnished patio and garden views. 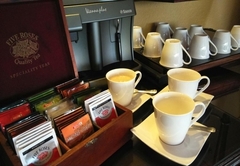 The room is equipped with a minibar, tea and coffee making facilities and a desk. 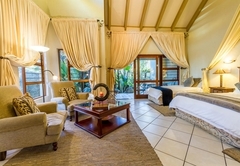 This very spacious, double volume, architectural suite offers a furnished patio with garden views and a King Size bed. 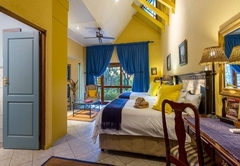 It features a private bathroom with a double-sized shower and extra large bath tub. 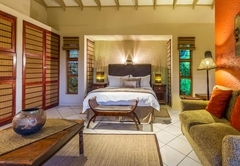 Overlooking the garden and a tropical Koi Pool, this double volume, spacious and air-conditioned architectural suite is furnished with a large queen-size bed and a single bed. It has a spacious sitting area with a coffee table and reading lamps. 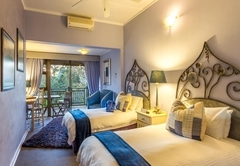 This spacious, double volume, architectural,suite has a balcony with views of Nelspruit and the tropical garden as well as the Drakensberg Mountains. 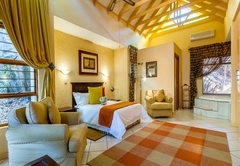 It offers a king-size bed and a double sleeper couch The room has a Spa Bath and double shower. 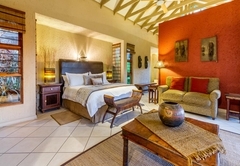 Located in the lush garden, this rustic air-conditioned self-catering unit offer a double bed and a single bed. 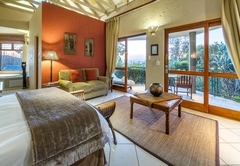 It has a lounge and a kitchenette area with fridge, microwave, oven and kitchenware. 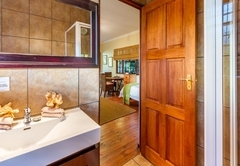 The cottage is equipped with a dressing table, TV. Response timeJorn's Gastehaus typically responds to requests in 5-10 minutes. Child policyChildren 6 years and older are welcome.